As well as being an industry leader in the manufacture of new heat processing equipment, HED® International, Inc. also provides fabrication facilities for in-house repairs and renovations to equipment previously in service. Our engineering staff will evaluate any system requiring repairs, renovations or modifications and provide you with a complete breakdown of all recommended work to be completed. Our offices and manufacturing facilities are located on over seven acres in Ringoes, New Jersey. Over 20,000 square feet of manufacturing space in amply equipped with the machinery and tools essential for the fabrication of both large and small furnaces, kilns, ovens, thermal systems and burners. HED® International, Inc. carries a complete line of replacement and spare parts for your equipment. Most standard items in stock, specialty items can be fabricated or ordered quickly for your convenience. Your technical sales representative can help you determine what parts you need and what items would be good to have available on location to minimize your down time. 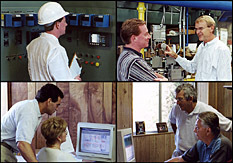 We also maintain a Database of User Manuals and important information about your equipment.